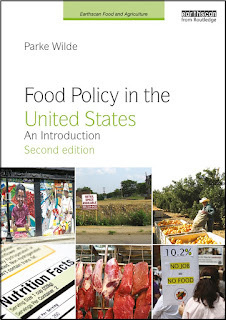 U.S. Food Policy: Can we improve the nutrition quality of the food supply by restraining international trade? Uh, "healthy products and unhealthy products"? WTF? Is corn really so "unhealthy"? Care to elaborate on that? Just a little? Or is that merely your personal bias coloring the otherwise mundane reality of agriculture and global trade? And who ever suggested the purpose of trade barriers is to control the nutritional status of any nation? Do we sanction North Korea merely to force them to eat local (when they are fortunate enough eat at all)? Is this podcast what passes for research and outreach at Tufts? Seriously? Overall, Parke, one of the least info-infused infomercials I've ever watched. If I didn't care about owning your book before (and I didn't), I certainly have no desire to possess it now. If it's anything like your infomercial it's a jumbled pants load of emotional old wive's tales dressed up as an academic tome...with no point and no substance. I wanted that I could get it by watching an episode of Dr. Oz. And I don't. Let me start with your question, "And who ever suggested that the purpose of trade barriers is to control the nutritional status of any nation?" Here is the commentary I discussed in the video, arguing that a leading trade agreement (the TPP) could pose risks for public health and nutrition. Did you find their argument persuasive? Or, like my video, do you come down somewhat more favorable to trade than that? If you follow-up on this thread, let me remind you the groundrules for this forum. No cussing (not even "WTF"). Your strong criticism of my work is allowed, even welcomed, but no spurious commentary on myself or my employer. If you just want to vent, all bluster and no substance, there are other forums that will offer you a mic. OK, I reviewed your link and encountered a second heaping helping of nebulous overwrought angst over the (conspicuously unspecified) "nutritional quality" of foods, some esoteric hand-wringing over food availability with only a tangential mention of price and a rather sinister (and snobbish) reference to "desirability of food". Seems there's some underlying unwritten rule that abundant, safe, affordable modern foods produced by modern corporations commonly found in global commerce are, apart from a food safety standpoint, inherently "unhealthy". Sadly, no explanation, no examples and no defense of this all too popular notion except for the predictable misty allusion to obesity, etc. Obviously, Parke, you place corn in this dubious category of "unhealthy". I noted that your linked reference chose different food categories, didactically went off on meat, dairy products and "processed foods" (the most feared of all gustatory boogiemen!). Of course there was the obligatory contempt for "global food processors", naming names but neglecting to specify their failings. We must simply assume they are evil through and through, I suppose. I'm no fan of unregulated no-holds-barred commerce and trade. Food safety hangs in the balance. But when we're reduced to quibbling over the "desirability" of foods in trade and invoking nebulous concepts and phobias to advise trade regulators, well Parke, that's when I begin to lose my temper. And that makes me cuss. You are welcome to shrug off sincere response as "bluster", Parke, if that makes you feel better. That won't improve your prospects, however. Just ask Hillary how that worked out for her. My use of corn as an example didn't reflect as much criticism as you think. Let's break this argument into its component parts. I have a point to share about trade, and I think you were unwilling to hear it, because my choice of illustrative example foods triggered your unreasonable fury. I'm willing to explain my point about trade, using whatever example of healthy diets is persuasive with you. If you dislike "nebulous concepts and phobias" as a guide to the healthfulness of foods and diets, then do you prefer scientific summaries of the balance of evidence on these issues? That would be a sensible position for you to take. Alternatively, perhaps you are just impossible to satisfy and will dance and dodge uncomfortably about any discussion at all about healthy diets?